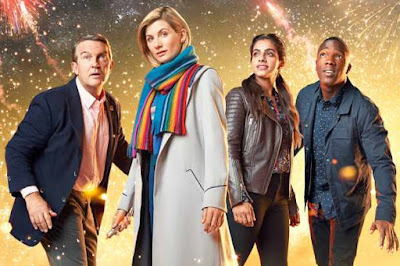 As series 11 unfurled, I got the impression that Chris Chibnall was holding back, pootling around the block rather than going in for the shot. If he was a footballer – and he’s penned some soccer related stuff for sure- he’d be the player with dazzling midfield skills which don’t quite end up amounting to a goal for the team. I recently re-watched `The End of Time` and whatever you think of the story it is jam packed with incident, excitement and drama. It involves you every step of the way and it’s exciting. 2018’s Doctor Who has been fine, good but never properly exciting. It has been polite but on a leash, just a bit too careful, a bit too concerned with making factual sense when all that really matters for a programme like this is fictional sense. `Resolution` from a more melodramatic opening to thrilling climax seems to make amends. Is it simply a finishing flourish or a taster for next series? Hopefully it’s the latter. In the 1980s the name of every Dalek story seemed to begin with an R so we should really have guessed that though it seemed to refer to the New Year, `Resolution` really meant Daleks. Or at least one Dalek. The episode corrals some of Chris Chibnall’s favourite aspects while pushing the boat out a little by having a big battle scene and a truly nail biting climax. It feels like the series finale that the previous episode was billed to be as it also resolves Ryan’s story to a large extent. You have to laugh though at yet another alien incident unfolding in Sheffield, this time underneath the town hall where an archaeological dig has uncovered a buried object purported to be part of some creature defeated centuries ago, split into three pieces and buried around the world. The production tries to hold off for as long as possible before the Doctor’s analysis of the DNA of a squid creature reveals what we already knew if not from the trailer then recognising the thing. 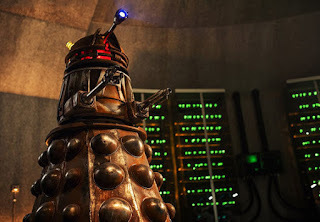 It must be difficult to think up new things to do with Daleks and this is the boldest gambit since 2005’s `Dalek` in which a single creature wreaked havoc making the metal meanies more powerful than they ever seemed before or since. Here, the creature is without even a shell so- in a sequence that mirrors the Doctor’s own forging of her sonic back in the first episode- it makes one out of steel. If Sheffield still actually had a steel industry the programme would be a great promo for them. As the story unfolds with the creature having captured one of archaeologists, Lin, the pace feels altogether more purposeful than most of this series’ episodes though there is probably still a little too much factual speak and too little banter. Chibnall has some pertinent Russell T Davies style barbs to hand though to liven things up though in particular the reveal that UNIT has been suspended after we fell out with our European partners! Now that was something the Remain campaign never sized upon! Later when the Internet goes down, a family are non plussed as to what they can do! In between the plot concerning Ryan’s Dad is dealt with courtesy of some excellent dialogue and playing. It would be too easy for the script to side wholly with Ryan yet when we get to hear his father’s take it transpires Aaron isn’t really the person Ryan has said he is but you can see how the latter’s perspective interprets it. In the end what both men have failed to do is communicate. It’s a deftly penned and written scene. I sometimes feel Chibnall is happier with this sort of material than he is with the adventure stuff though this time he doesn’t disappoint on that score either. 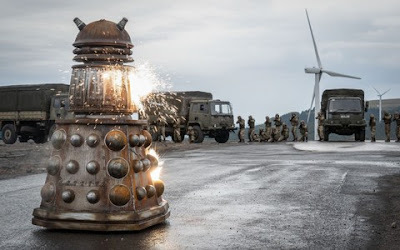 There is finally some substantial action with a superbly directed clash between the newly reconstituted Dalek and some troops- Wayne Yip directs the story with verve and his view of this battle makes it seem both fresh and explosive. Yip brings a cinematic style that suits the heft of the metal and fire, amping up the drama. We need more of this sort of stuff next series please! As if that scene were not enough, the ending is Chibnall’s first foray into the sort of chaotic yet thrilling climax that was part and parcel of Russell T Davies’ version of the show. It elevates an episode when you feel anything could happen. For Jodie Whittaker this is the episode that makes her feel more established. Some of the behavioural tics she was displaying earlier on have been sidelined and she is getting more opportunity in this episode and the last one to show the Doctor’s strength and inner resilience. We’re starting to get a sense though that a lot of this is bluster and she isn’t quite as good as she says she is, something else to explore perhaps in coming episodes. The one niggle I would highlight is how along with the other contemporary stories this go round, there is little outside context as to how events are affecting or being perceived by the wider community. Previous iterations of the modern show have often used news broadcasts to underline a wider scenario it would be impossible to show on the budget but so far Chibnall’s Doctor Who takes place in some sort of isolation. He seems to have abandoned previously established awareness of aliens but you don’t often get a sense that anyone else is in danger save for the characters we see. Additionally having made such a play of setting several episodes in Sheffield we rarely see the city as most would recognise it, the action taking place in anonymous alleys, garages and cafes. It could be anywhere really. Quite the opposite of the way for example Torchwood highlighted Cardiff. `Resolution` despite its title brings Doctor Who to something of a crossroads. This series has been a firm enough foundation but a second should not repeat the same moves. Both of Chris Chibnall’s predecessors upped the ante each year and he too needs to do the same. I would say he needs to shed some of the caution and expositional baggage that made episodes sometimes seem too safe or drag in the middle and try to make matters less predictable. Nobody watches Doctor Who for a lecture or mild peril. There is a place for morals and lessons but not as big a place as there is for thrills, spills, fun and excitement. I’ve rarely ventured to the symbolic edge of my seat this time round though `Resolution` came closest which is encouraging as we enter another enforced gap.